Far North Holdings has filed a resource consent application with the Far North District Council for the ability to develop and sub-divide 17 sites located along Franklin, Baffin and Kellet streets in Opua. An application to Northland Regional Council for earthworks consent has also been filed. The company says no decisions have yet been taken to build anything on the sites, or who the properties would be marketed to. The potential development would help address growing demand for good-quality housing in the Bay of Islands and projected population growth in Opua. Mr Nock invited Opua residents to review the plans submitted to Council and to let him know if there were any concerns at this early stage. “We could have sought a higher, apartment-style development but we did not feel it was in keeping with Opua. Instead, the plans are for a low-density residential scheme in line with the approved District plan, within an established residential area. They are entirely within Consent parameters and we don’t anticipate any formal requirement for public notification or consultation. The land is currently vacant but has in the past been used for Harbour Board housing. The plans use the land’s contours and reflect existing Opua housing and lot sizes. The proposed units are modest in scale and reflect the multi-storey development in the area. The sites range in size from 445m2 to 5,790m2. Plans are for the development of 15 three-bedroom accommodation units, one each within the subdivided sites. These are all depicted as the same design, although a mix of designs may ultimately be used, featuring two car parks and storage within the ground floor, three bedrooms on the first floor and kitchen, living and dining on the second floor. The footprint of each unit is around 80m2. The largest site, number 17, occupies a significant portion of the area and would be set aside as a green reserve in the middle of the development. 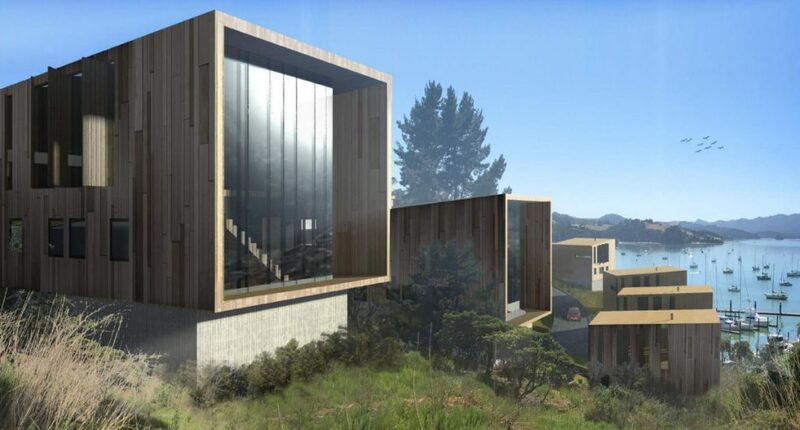 This would include a fitness trail that is being planned and project-managed by a group of parents associated with Opua School, and which Far North Holdings will help create once plans are ready. It is envisaged that another of the sites would be used in the future for an as-yet undefined ‘cultural unit’ to meet local community needs. The units will connect to the reticulated waste water treatment system and vehicle access to each site is from the extension of Kellet Street. Far North Holdings envisages that parking and traffic circulation at the nearby school will not be affected. The purpose of this development is to protect the waterfront, boating and major tourist area of Paihia from damaging sea swells. It also provides for an expansion of maritime and land-based facilities for the public and commercial sectors. A resource consent application has been granted, with Ministerial approval received on 11 October 2010. Changes to the original concept have been made to mitigate concerns expressed by local iwi and DOC. Close to 325m of new beach between the Paihia Wharf and Nihonui Point, replenishing the foreshore area and creating an attractive recreation area for the local community and visitors. Close to 4,000 sq.m of reclamation to improve public access and provide for a hew helipad, landscaped public areas, a promenade, seating and new public facilities. New boardwalks, viewing decks, connecting walkways, public shelters and seating. Artificial reefs to create 440 metres of breakwater. A new navigation channel to the Paihia Wharf. An additional twelve berths for visiting craft inside a 160-metre floating wave attenuator. A new single-storey cafe and restaurant building, and food kiosk. A new fuelling pontoon installed at the western end of the existing wharf wing. Deck areas around the existing aquarium and cafe extended to create an outdoor dining and public viewing platform, including the provision of weigh-station facilities for the big game fishing industry. The redevelopment will provide a new level of community interaction with the coastal environment and accommodate increasing demands from both commercial and recreational boaties for a safer navigational area in which to berth and load passengers. The project has been put on hold pending improvements to the economy.